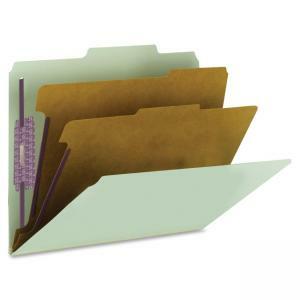 Sheet Size: 11.75" x 10"
Protect your letter-size documents and fingers with Smead's patent-pending, SafeShield Coated Fastener Technology - the solution to fastener issues, including paper tears, finger cuts and excessive fastener crinkling. The cover has two 2" SafeShield bonded-style coated fasteners in positions 1 and 3. 2/5-cut tab is right of center. Sturdy, Tyvek gusset expands 2". The cover is made of 20 point, PressGuard, heavyweight Pressboard stock with a special coating to resist moisture and stains. This extra-durable classification folder also features two dividers with 1/3-cut tabs to create six separate filing surfaces within one folder. Each 17 point kraft divider has one 1" SafeShield coated twin-prong fastener.